Carlsen and Harikrishna win, as does Eljanov, who leads on 2/2; Ragger leads Challengers. 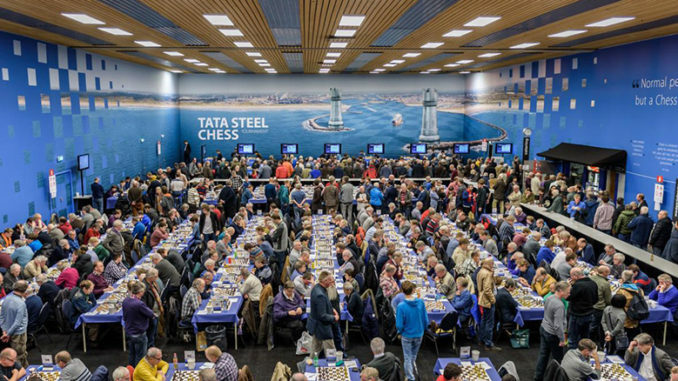 Round two of the Tata Steel Chess Tournament 2017, took place on Sunday 16th January, in Wijk aan Zee, the Netherlands. Things livened up following the rather quiet round one, and we saw three decisive games in the Masters Group. Magnus Carlsen got his winning tally started for this year’s tournament, beating Radoslaw Wojtaszek with White. The World Champion resorted to 6.a3 in the Sicilian Najdorf, a rare line to say the least. After 6…e5 7.Nf5 d5 8.Bg5 d4 9.Bxf6, Black declined the sharp …gxf6 in favour of 9…Qxf6. This seems to be a novelty actually, which for move 9 in a Najdorf Sicilian would be no small thing. Whether it was a good novelty, however, is another thing; White took easy development from it, not least posting a knight on the d5-square, with a tempo on the Black Queen, which returned to d8. Carlsen then wasted no time at all in setting up camp towards Black’s King position. With his Queen already situated on g4, his 17.Rh3 and 19.Rg3 were super-aggressive and it was clear that the Norwegian had his sleeves rolled up. In this situation, every move counts for the opponent, and Wojtaszek’s 18…Ra7 was a little out of context, instead, …Qc8 seems quite neutralizing and White may have nothing better than to exchange Queens. 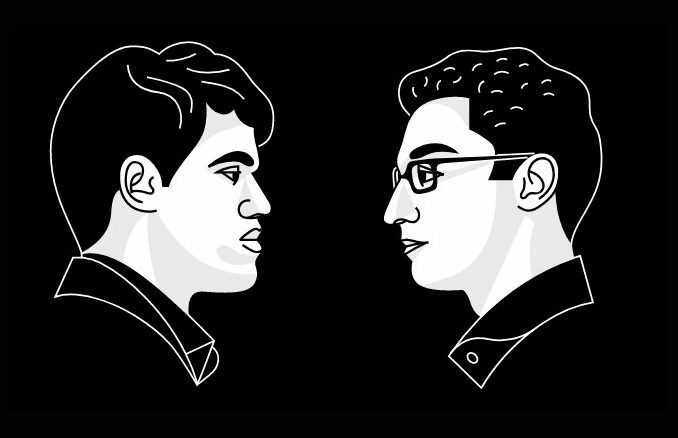 However, it would leave Carlsen with a very small edge, but in a position that he can play on in until doomsday — just his forte. Perhaps this was why Wojtaszek preferred to maintain pieces. It seemed to serve him alright for a little while, though White was better there was nothing commanding. However, 27…Ra6 was a little ineffective and should have given way to the more in context 27…a4. Black had done some groundwork on the Queenside, yet seemed to be reluctant to use it. Black was already coming under some pressure when he made the very serious mistake of 30…Qb6(?). This allowed White to seize a very dominant position with 31.Qxe5 and this was the beginning of the end for his opponent. A pawn up and with a winning position, Carlsen had the comfort of being able to consolidate his position without losing any initiative and he does this like no one else. Black’s own position seemed to deteriorate move by move and 44.Rxa4 saw White on the verge of going two pawns up and Black resigned. Loek Van Wely and Pavel Eljanov got into a very positional Queen’s Indian. It was not to end well for the Dutchman, unfortunately, who after playing so well for 75% of the game, opened a total barn door for his opponent towards the end. The position in the diagram, below, shows this. From the diagram position, above, White continued with the highly flawed 33.Nf4(? Qd7=) and this allowed Black to pounce with 33…Rc1+!. The problem here is not the check in itself, but that Black will be playing …Qd8 or …Bc6 afterwards, depending upon what White plays. Unfortunately, White has too many weaknesses, his Queen is exposed, his back rank is exposed, the semi-open g-file makes his King very easily accessible. On top of this, h4 is hanging and difficult to protect adequately, e5 is the same. And White’s position crumbled. There followed 34.Kh2 Qd8 35.Nh3 Qxh4 and Black was winning by a mile. Eljanov had absolutely no problem in converting the point. Pentala Harikrishna took Baskaran Adhiban to a position that he had been in in 2011 against Yuriy Kuzubov. It was in the Ruy Lopez Arkangelsk Defence, with Adhiban as Black as in this game. Harikrishna varied with 18.Rad1 (Kuzubov had used the other rook, playing …Rfd1) but Adhiban seemed quite well prepared for this and actually ended up slightly better. However, Black seemed to become either unsure of how to proceed or of the believe that neither could make progress and shuffled his King with 29…Kg6 30…Kg7 31…Kg6 and this saw White restored to an equal footing and not interested in ending hostilities. Harikrishna pushed on with 32.g4 and then sacrificed a pawn in order to lure the Black King out into the open. This should have seen a draw with accurate play, but in such situations a blunder is always possible and that is what happened here. 39…Kf5?? 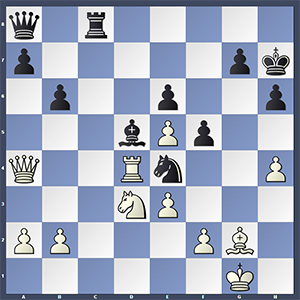 from Adhiban allowed Harikrishna to seize the point. There followed: 40.Nh4+ Kg5(?? mate in 4) 41.Rg6+ Kxh4 42.Rh1+ Bh3 43.Rg3 and Black resigned. The other games saw draws. This included the Bogo-Indian of Aroninian-Yi, but White enjoyed by far the best of things out of the opening. The position became quite immobile, however, and after exchanges there was only the open d-file with which to operate. Both sides had this covered, so the point was split. 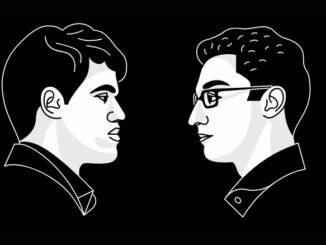 Anish Giri and Wesley So got into a Fianchetto Grunfeld, which saw the American Grandmaster produce a novelty on move 9 with …Be6. It was not really a very eventful game, White was slightly better throughout, but didn’t find a way to make anything of it and the result was a draw in 43. Richard Rapport did not choose the most ambitious of openings against Sergey Karjakin. The Hungarian chose 1.b3 and the Russian equalised fairly effortlessly. Perhaps Karjakin could have played for more in the game, but seemed content with a very comfy draw. Nepomniachtchi-Andreikin saw a Scotch game, but not very much. The players obviously were not up for it today and had repeated to a draw by move 21. Masters Group Standings after Round 2. Masters Group Round 3, Monday the 16th, 13:30 local time. The Challengers group went one better then the Masters and produced four decisive games. Markus Ragger got the better of Tingjie Lei with the black pieces, but it took 84 moves to do so and they might be wishing there was a rest day on Monday, but there isn’t. The other points went to Jeffery Xiong, who outplayed Jorden Van Foreest, also in a long game, of 64 moves. Like Markus Ragger, Ilia Smirin picked up a point with the Black pieces. His victim was Shanglei Lu. Their game went the way of a Sicilian Scheveningen and Black got the better of things rather quickly and didn’t look back. British Grandmaster Gawain Jones also picked up a point, at the expense of Sopiko Guramishvili, who had such a fine time of things in the previous round. She had an unpleasant time of it in this round, in the Moscow Sicilian and was checkmated on move 35. The other games were drawn. This leaves Markus Ragger in the lead of the group, with a 100% score so far. Challengers Group Standings after Round 2. Challengers Group Round 3, Monday the 16th, 13:30 local time.